This section provides helpful hints on how to care for your inkjet cartridge to ensure the best possible refill experience. By following a few simple techniques, you should be able to get multiple refills from your cartridge with great printing results. Always adhere to these general guidelines when printing or transporting cartridges for refilling…. Refer to illustration below for a review of selected print cartridge components and definitions. These terms are used in this and other sections. Refill your cartridge promptly after your print quality degrades. When one color begins to fade or run out, it is time to refill the cartridge. You should refill the cartridge as soon as possible after running out. If you continue to print with one color empty, the print head nozzles will be damaged and the cartridge may not refill properly. Until you are ready to transport and refill your empty cartridge it is best to keep the cartridge in the printer, where it is “capped”. Transport your cartridges properly. Carefully protect your cartridge from the elements. Immediately after removal from the printer, place the cartridge in a sealed envelope and get it refilled within a few days. Leaving a cartridge out for days or weeks will dry the cartridge and may prevent it from being refilled. Keep the cartridge in a ‘print head down’ position as much as possible. This will keep ink at the print head which minimizes drying out. Do not put your cartridges in a plastic bag because the bag can easily contact the print head and cause ink to leak from the cartridge. On a color cartridge, this can contaminate the colors, resulting in poor print quality with your refill. Handle your cartridges carefully. To avoid damage, the print head should not be contacted directly. Do not try to clean the print head; it can be scratched, causing it to fail. During interim storage, keep the cartridge in a cool place away from heat and sunlight. This will help reduce the risk of the cartridge drying out. Print in draft mode. Most of the items we print out do not need to printed at the highest quality. Simply printing in draft mode can give you 2 times more prints from your cartridges. Store your cartridges properly. 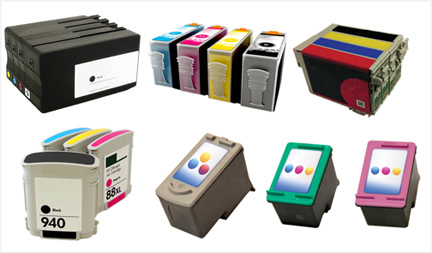 If stored under the right conditions, ink cartridges can stay in good condition for up to two years. Make sure they are in a place that is not too hot or too cold, keep the cartridges in an upright position. Use the printer frequently. If you use your printer on a regular basis you can help keep your cartridges in good working order and prevent the nozzles from getting clogged by dried ink. It is suggested that you print at least a page or so every couple of weeks at a minimum. Additionally, if you have an old cartridge that isn’t printing at the moment and is possibly clogged, you may want to attempt to first try and recover it – refer to video below. Many times printing problems are blamed on a refilled cartridge. Although the refilled cartridge might be involved, checking the printer is also necessary. Be sure to follow your printer manufacturer’s recommendations for cleaning the printer. As a printer is used, ink, paper dust, and other debris can accumulate in the printing area where the cartridges are stored in the printer. Most printers have specific procedures that you can follow to ensure the appropriate areas are clean and providing the best performance. The manufacturer’s websites and blogs also have service notes or bulletins for known cartridge and printer related problems with your printer model. It is useful to review these sites to determine if you have a specific printer problem that needs to be fixed. If you have any questions, you should contact the printer manufacturer. Remember, they cannot prevent you from using refilled cartridges and they cannot void your warranty unless the specific issue was known to be caused by a refilled cartridge. The replaceable or semi-permanent PRINTHEAD will eventually fail over time with usage and age. NOTE: there are two (2) PRINTHEADs for HP 88 & 940 ink-series printer models. Click here for more information. NOTE: Replacing the ink cartridge is the best way to verify cartridge/printer performance.